This rather cute looking straw dog was actually something no farmer on Orkney wanted to own as it was the booby prize for being slow to get the harvest in. 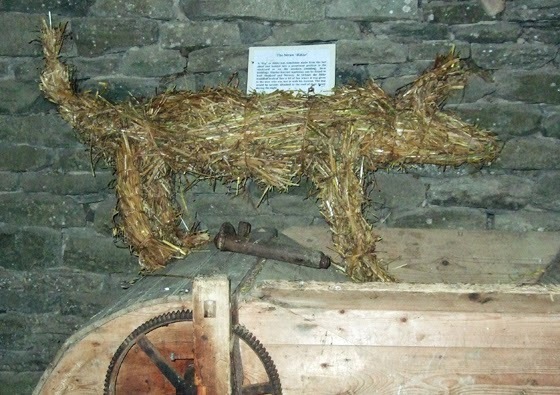 The straw dog, or "bikko" was on display at Corrigall Farm Museum, which I visited when I was on holiday in Orkney last month. 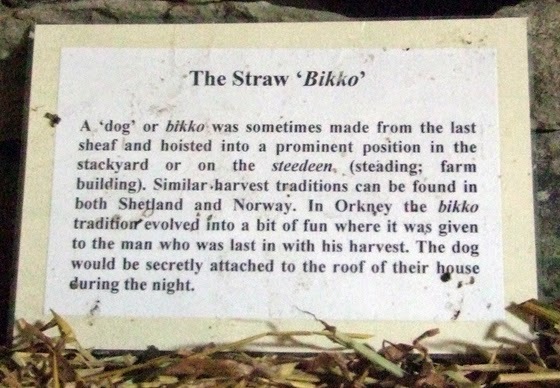 The description next to it in the barn explained that in parts of Scotland and Norway the bikko was traditionally made from the last sheaf to be harvested. It was hoisted into a prominent position on the farm building - or "steedeen". In Orkney, "The bikko tradition evolved into a bit of fun where it was given to the man who was last in with his harvest. The dog would be secretly attached to the roof of their house during the night."